Just like the great plague that swept through England in 1665, social media is swiftly taking over the world, only under more optimistic circumstances. With the rapid growth of this social media phenomenon, many companies within the Australian travel industry have realised that not embracing social media is a competitive disadvantage. The purpose of social media is clear; to generate interest and increase awareness, communicate and engage with your audience as well as extending your customer base and to drive traffic toward a company. STA Travel is a full service travel retailer boasting an impressive worldwide network of more than 450 branches, with more than 100 in Australia and New Zealand alone. They operate in more than 75 countries and their turnover exceeds USD $1.1 billion worldwide. STA Travel’s core purpose is to make travel affordable and attainable, particularly for students and people under 26. Blog – While STA Travel Australia does not sport its own company blog, they do offer travellers the option to create their own travel blog via their website. Twitter – @statravelAU have been on Twitter since December 19, 2008 with a total of 466 tweets with 6,517 followers and counting. They seem to tweet every other day, with no steady tweeting pattern. Their tweets contain relevant content inline with their theme however I feel they could be doing a lot more with their account in terms of promotion, communication and engaging with their followers. YouTube – STA Travel Australia do have their own YouTube channel, however up until three weeks ago, it seems that it had not been given much attention for twelve months. The channel has a total of 1,013 upload views since its creation on November 17, 2008 and a total of eight subscribers; me being one of them. Facebook – STA Travel do a much more impressive job engaging with their 4,735 Facebook fans, than they do, Twitter. Content is updated and communicated at a much more consistent rate and they respond frequently to all wall posts. Flickr – STA Travel boasts quite an impressive Flickr photostream. There are organised albums for each continent containing many amazing and beautiful images as well as an album for the world traveller intern (USA) and a company album. Linkedin – Unable to locate a company group page, only a company profile page. Qantas is the world’s second oldest airline. Founded in the Queensland outback in 1920, it is Australia’s largest domestic and international airline and is recognised as one of the world’s leading long distance carriers. The Qantas Group today employs approximately 35,000 people and offers services across a network spanning 173 destinations in 42 countries through Australia, Asia and the Pacific, the Americas, Europe and Africa. For the full year ended 30 June 2009, Qantas reported a profit before tax of $181 million; an 87 per cent decrease on the full year to 30 June 2008. Blog – Qantas’ Travel Blog – Insider tips for the discerning traveller is an excellent source of travel information for the, well, discerning traveller. The blog is updated at frequent intervals and the information provided is current. Blog contributors include the Travel Insider team, writers from Qantas The Australian Way, Qantas Cabin Crew and Qantas ambassadors. The diverse mix of writers ensures an array of opinions, views and stories are covered. Twitter – Handling themselves on Twitter is something Qantas does particularly well. Qantas sports four separate Twitter accounts, each serving a separate purpose. 1) @qftravelinsider: Created on January 13, 2009 with 5,369 followers and 1,940 tweets, Qantas use this account to share inspirational travel tips. Tweets occur every other day. 2) @QantasUSA: Formed on March 22, 2009, this account is used to update customers in the US. With 3,729 followers and 460 tweets, it seems Qantas use this account mainly to respond to their followers’ praises or concerns to attain that ‘consumer engagement’ part of social media. 3) @QantasVacations: With a start up date of April 24, 2009, this account promotes both airfare and vacation deals from Qantas. Unlike the previous two accounts, this one reaches out to 580 followers with only 222 tweets to date. 4) @Qantas_careers: The newest of Qantas’ Twitter accounts from March 30, 2010. This account is strictly used to promote job openings with Qantas in Australia and abroad with good hashtag use to generate #jobs interest. YouTube – Qantas boasts an extremely impressive YouTube channel. It is updated frequently and offers an insight into the world of Qantas. The channel has a total of 875,034 upload views since its creation on February 14, 2006 and a total of 2,025 subscribers. Facebook – Similar to that of STA Travel, Qantas do a remarkable job engaging with their 24,257 Facebook fans. Content is updated every few days and discussion amongst fans on their wall posts is high. Flickr – The Qantas Travel Insider has a Flickr photostream with well organised albums presenting images from various countries as well as Qantas The Australian Way magazine covers. Linkedin – If you have an existing Linkedin account and you’re signed into it, Qantas have both a group for current and former employees to share stories and keep in touch and another jobs group that has been established to source resources directly by internal Qantas staff. While I cannot offer input on these two groups as I am not a member, it is impressive that Qantas is also joining the Linkedin phenomenon. Jetstar Airways Pty Limited is a wholly owned subsidiary of the Qantas Group, with its Australian low fare operations first commencing in May 2004. Jetstar is Australia’s low fares carrier and fare leader now operating to 19 Australian domestic destinations and an existing 11 short and long haul overseas destinations. Initially operating domestic services to 14 destinations along the Australian east coast, Jetstar has since grown to be almost four times its size and within the next five years, it is expected to be ten times its current size. Blog – Although not technically a blog, Jetstar’s blog like-layout of their Jetstar magazine is pretty darn close. It offers great content on destinations and activities in cities that Jetstar flies to. Its user-friendly design makes it easy to navigate and there is the inclusion of the Editorial’s Blog with raves and rants from the magazines editorial team. Twitter – Unlike their owners Qantas, @JetstarAirways only has one Twitter account which they put to excellent use. Since January 21, 2009, they have managed to gain 10,272 followers within 663 tweets. Jetstar tweet on an almost daily basis not only to promote their airfare and vacation deals and competitions, but also to address any questions or concerns their followers are having with the airline and then go that one bit further by arranging for their customer care team to solve the problem via phone. YouTube – Jetstar possess’ a rather bright, snazzy YouTube channel that was created on January 7, 2007. It currently has 108 subscribers with 239, 332 upload views. The videos, which are uploaded regularly, perfectly encapsulate Jetstar’s corporate culture. Facebook – This one was a bit surprising and disappointing. Jetstar Australia’s Facebook page only offers a description of the company and then a related posts section which is an automatically generated feed that picks up on anyone else’s posts on Facebook that make mention to Jetstar. There is no way of open communication between Jetstar and their Facebook fans. Kinda a let down. Jetstar, if you accept my application into your Corporate Graduate Program for 2011, I promise to fix this for you. You have my word. Let the blogosphere be my witness(es). Flickr – Jetstar does not have its own official Flickr photostream. Virgin Blue took off on 31 August 2000 with two aircraft, one route and 200 team members who shared a clear goal to revolutionise air travel in Australia. Not only did the airline halve the cost of airfares, it also re-introduced genuine Guest service to the flying public along with a strong commitment to being the best in the business. Since its launch Virgin Blue has evolved from a start-up entrepreneurial business to become Australia’s leading major airline for service, on-time performance and value for money, as well as being one of the world’s most profitable airline Groups incorporating Virgin Blue, Pacific Blue (Aus), Pacific Blue (NZ), Polynesian Blue and V Australia. Blog – Currently no blog for Virgin Blue itself (only V Australia), however, Dean from the Virgin Blue Social Media Team kindly noted to “watch this space” when commenting on a previous blog post. Twitter – @VirginBlue make Twitter look easy. Having acquired an interest in Twitter earlier than most Australian companies on July 11, 2008, they have a following of 17,433 with 2,503 tweets. They tweet on a daily basis and although they do promote deals, their Twitter feed looks like it is used mainly as a form of responsive engagement between the airline and its followers. YouTube – Born on May 17, 2009, Virgin Blue’s YouTube channel has upload views of 84,179. Their video content is entertaining, exciting and portrays a positive vibe and corporate culture within the Virgin Blue team. Facebook – Virgin Blue does Facebook quite well projecting a positive image and updates to their 20,353 Facebook fans. Content is updated every few days and discussion amongst fans on their wall posts is high. The clever use of Facebook fans only sales generated to grab awesome fares is a great way to maintain and satisfy Facebook fans. Flickr – Virgin Blue does not have its own official Flickr photostream, however, V Australia does. Discovered by a young New Zealander in the Spring of 1962, Contiki Holidays is now a worldwide leader in vacations for 18-35 year-olds. For over 40 years, Contiki Holidays has been taking travellers around the world and offering them an unforgettable travel experience. Their tours have been individually created to include a mix of sightseeing, free time, culture, socialising and adventure. Regardless of your destination or travelling style, Contiki is committed to providing an amazing trip at an affordable price. Blog – Contiki sports its company blog via WordPress. 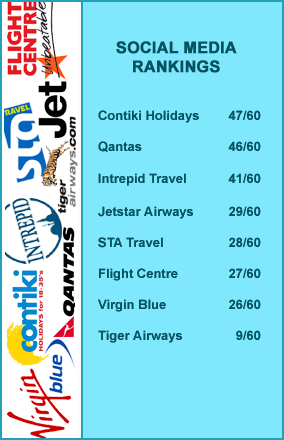 It includes a heap of great destination and activity information for anyone going or thinking about going on Contiki. New blog posts are contributed every few weeks and the blog is easy to navigate. Twitter – @contikiaus was introduced to Twitter on Nov 18, 2008 and has since gained 2,248 followers and tweeted a total of 1,106 times. They tweet every other day to promote Contiki specials and deals and to encourage Twitter conversation and interaction amongst travel lovers, Contiki virgins and the not-so-Contiki virgins (no puns intended… maybe). YouTube – Contiki have had their own YouTube channel since June 24, 2008 with 140 subscribers and 59, 365 upload views. On occasion, Contiki uploaded videos to showcase what their holidays are all about, with the latest upload dating back 6 months ago. Facebook – One of the more impressive Facebook pages out of the ones included in this analysis. With this one, Contiki’s 15,699 Facebook fans have access to post directly to the page wall to inquire amongst other fans to see if anyone is participating in the same tour as them or to share their Contiki adventure with others. Content is updated almost daily and Contiki do a great job responding to their fans queries. Flickr – Contiki possess’ a swanky Flickr photostream neatly organised into city and country albums. The images included are beautiful and truly represent the scenery, landmarks, parties and fun that Contiki encompass. Linkedin – If you have an existing Linkedin account and you’re signed into it, Contiki has a group for new travellers and alumni. Although there isn’t much discussion going on within the group, it is currently made up of 34 members. Flight Centre is Australasia’s best known travel agency group and now boasts more than 2000 shops and businesses in 11 countries. The company, through its retail and corporate brands, provides a complete travel service for leisure and business travellers in Australia, New Zealand, the United States, Canada, the United Kingdom, South Africa, Hong Kong, India, China, Singapore and Dubai. Internationally, the company employs about 8,000 consultants and support staff. Blog – No company blog. Twitter – @flightcentreAU jumped on the Twitter bandwagon on March 16, 2009 and have since command the attention of 1,854 through 201 tweets. They tweet sparingly; with maybe one or two tweets every couple of weeks. The content of many of their tweets would get a better response on Facebook. They don’t seem to have quite embraced Twitters full potential as yet. YouTube – Unfortunately I don’t think Flight Centre Australia has its own YouTube channel. Upon searching, I was only able to find Flight Centre New Zealand and Flight Centre Canada‘s channel. Shame. Facebook – As mentioned above, their tweets do receive a better response on Flight Centre’s Facebook page. With 2,393 fans, Flight Centre does a great job posting content that generates interesting conversation amongst their followers and themselves. They’ve also made good use of the photo album feature posting beautiful images from right around the world. Flickr – Flight Centre has a wonderful Flicker photostream neatly organised into country albums showing off some spectacular photo work. Linkedin – If you have an existing Linkedin account and you are signed in you can join the Flight Centre group along with the other 63 members. Like Qantas, I am unable to offer input for this group as I am not a member. Again, impressive that they’ve utilised this social media platform over a blog or YouTube channel. Tiger Airways Australia, is an ultra-low cost airline which commenced services in the Australian domestic airline market on 23 November 2007. It is a subsidiary of Tiger Airways Holdings, a Singapore-based company, which is owned partially by Singapore Airlines. The airline is based in Melbourne, Victoria, with its main base at Melbourne Airport. Twitter – @tigerairwaysaus has not touched its Twitter account since July 13, 2010. Sadly, Tiger’s Twitter presence died a slow and painful death (of 299 tweets since July 16, 2009) boarding a direct flight out to Twitter heaven leaving all 2,419 of its followers abandon and helpless. YouTube – Like Flight Centre, there is no YouTube channel for Tiger Airways Australia, only Singapore. Facebook – Tiger Airways Facebook page is primarily Singaporean based, however, it does include deals for Australian fans too, so for this instance, I will let it pass. Tiger does a reasonable job updating its Facebook page with current content; deals, promotions etc. Their posts generate lots of interaction and discussion amongst their 52,775 fans. Flickr – Tiger Airlines does not have an official Flickr photostream. Intrepid was started in 1989 with a passion to get travellers off the beaten track in Asia. Inrepid wanted to share some of the special places they knew and introduce their travellers to different cultures and ways of life. Intrepid’s core purpose is to enrich peoples lives by creating unique, interactive travel experiences.They provide fun, affordable and sustainable travel adventures that are beneficial to local communities. Blog – Intrepid posts several blog posts weekly full on enriching content directly relating to their product, beliefs and target audience. Their blog is visually appealing and easy to navigate. Twitter – Tweeting since July 30, 2008 @Intrepid_Travel has tweeted 1,197 times, reaching out to 4,514 Twitter followers. Intrepid runs promotions and competitions to engage with its target audience and keep them enthralled multiple times on a daily basis. YouTube – Intrepid’s YouTube channel was born on October 22, 2007 and has since attract 99,105 upload views. Their videos are funky and fresh and new contributions are made to the channel regularly. Facebook – Like Contiki, Intrepid’s 6,191 Facebook fans have access to post directly to the page wall to inquire amongst other fans to see if anyone is participating in the same tour as them or to share their Intrepid adventure and photos with others. Intrepid encourage discussion amongst its fans and also has a beautiful photo gallery showcasing the many destinations they travel to. Flickr – Intrepid Travel does not have an official Flickr photostream. Linkedin – If you have an existing Linkedin account and you are signed in you can join the Intrepid Travel Alumni group to connect with fellow Intrepidites pase, present and future. The group currently consist of 30 members. After carefully analysing the use of six different social media platforms amongst nine top shot companies within the Australian travel industry, the results can be viewed in a hierarchy of highest score to lowest. Contiki Holidays comes out on top for best utilisation of a diverse range of social media tools to interact and reach their audience, followed closely by Qantas and Intrepid Travel. Tiger Airways takes the wooden spoon; I suggest maybe using it to stir up and implement a fresh, new approach to the way your company exploits social media. This entry was posted on Friday, September 24th, 2010 at 1:37 AM and is filed under Airlines/Airfares, Australia, Contiki, Marketing, Social Media, Travel. You can follow any responses to this entry through the RSS 2.0 feed. You can skip to the end and leave a response. Pinging is currently not allowed. Great post! It’s a shame that most companies were let down by not using Twitter to it’s full potential. They could be doing so much more! Another travel company that are using social media I have seen is Air Asia Australia (http://www.facebook.com/AirAsiaAustralia). They’re running a Facebook comp that seems to be increasing their fan base nicely.